I love Mexican food! However, Mexican meals can become repetitive. It’s usually chicken or beef in some sort of tortilla with rice and beans. Don’t get me wrong, I would eat enchiladas all the live long day, but I wanted to switch things up! One of my followers suggested this recipe to me and when I saw sweet potatoes in with the chicken I thought to myself, “there’s no way the sweet potato will be incorporated with the chicken and this wont be that tasty!” But its quite the contrary! Turns out, the sweet potatoes add a little hint of sweetness and I didn’t even notice them in there! It’s a great way to hide some extra nutrition in with your meal! Tip: You can shred the sweet potatoes with a shredder, but I’d recommend tossing them in to a blender or food processor. This saved me a ton of time and gave me an even cut on all of them, which made them easier to incorporate into the ground chicken! 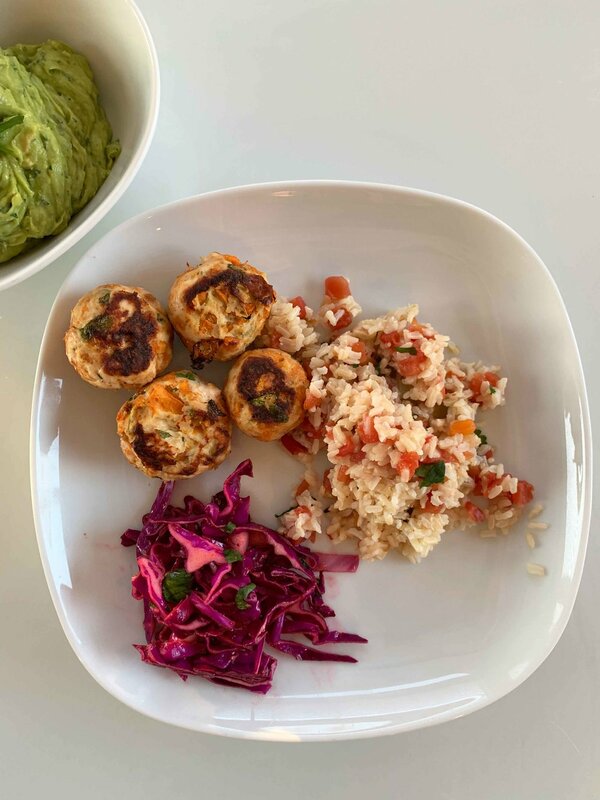 The meatballs are not really a full meal, more like an appetizer, so I added some similar, but different, Mexican sides. First off, I wanted to have that classic Mexican restaurant rice but with a little bit of a kick! I took a can off diced tomatoes and green chilies and mixed that with the cooked rice. It gave it a fresher taste and the chilies provided some nice heat! Secondly, I took red cabbage (not sure why they call it red cabbage when its clearly purple 🤷‍♀️) and sliced it thinly and marinate it in lime, oil, and Mexican spices. Red cabbage is great source of nutrition and help out with crows feet! Before I server it, I mix in some freshly chopped cilantro! Finally, the meatballs needed something. Italian meatballs get red sauce, Turkish kofta rolls get tzatziki, so I needed something to compliment the Mexican flavors so I settled on a lime cilantro avocado dip! I took avocados, lime juice, olive oil, cilantro, spices, salt, and pepper and put them in the blender and blended until smooth. I came out to be basically like guacamole, but it was still really good and fit in perfect with the meal! Hopefully this will bring you a little extra fun and nutrition in your next Mexican meal! 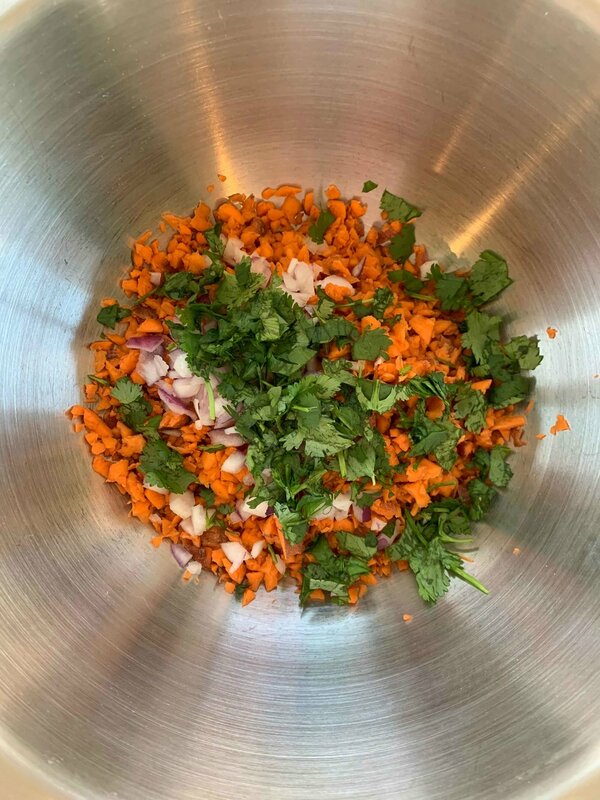 Combine chicken, sweet potato, red onion, 2 TB cilantro, 2 tsp garlic powder, 1 tsp oregano, 2 tsp cumin, 1 tsp chili powder, salt, pepper, olive oil, and almond flour in a large bowl and mix until well combined. Using your hands, make roughly 20 meatballs and place them evenly on the baking sheet. Then push them down with your hand to flatten them slightly. Bake for 20-25 minutes, flipping once halfway through. While the meatballs bake, in a large bowl mix together 1 tsp cumin, 1 tsp chili powder, salt and pepper, lime juice, and 1 TB olive oil. Mix in red cabbage and set aside, stir occasionally. Remove meatballs from the oven and allow to cool for 5-10 minutes. Once the rice is cooked, open and drain the can of diced tomatoes and green chilies. Mix with cooked rice, salt and pepper to taste. Serve everything on a plate with cilantro, avocado, and lime!